The four-time defending Conference USA champions are the projected school to win the league for a fifth straight time as Western Kentucky begins 2018 as the league favorites – the fourth consecutive time in the preseason. Leading the way for the Lady Toppers is Rachel Anderson, who was also voted as the C-USA Preseason Player of the Year. They not just won the league for the fourth straight time in 2017 – en route to another NCAA Tournament appearance – but also reached that many years of 30+ wins season at 31-4. In total, they received five of the 13 first-place votes. 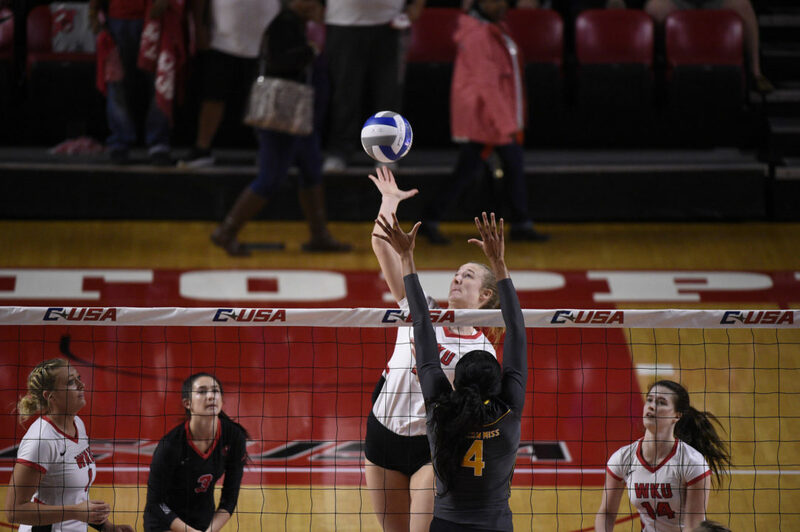 Despite their conference dominance, five other schools also received first-place votes because Western Kentucky is undergoing some key losses like 2017 C-USA Player of the Year Alyssa Cavanaugh and Setter of the Year Jessica Lucas. Rice, who was pegged as the other top two team earned two of those first-place projections. They bring back two Preseason C-USA players in Grace Morgan and Nicole Lennon from a team that went 11-3 (third) in league play last season and made the NIVC Tournament. “I think Rice may come into the year as the most talented team on paper and certainly Genny Volpe does a great job and they have been right there competing for a championship the last several years,” Western Kentucky head coach Travis Hudson told VolleyMob. Florida Atlantic and Southern Miss, picked third and fifth respectively, each nabbed two as well. Interestingly enough, FAU landed more 2018 C-USA Volleyball Preseason Team players than anyone else with three in Ivone Martinez, Sigourney Kame and Abbie Reid. Southern Miss got a pair on the list in Sarah Bell and Kylie Grandy. The team that actually tied with Western Kentucky in the regular season before falling in the Conference USA title match was North Texas. Karley York and Barbara Teakell are on the preseason team and return from the squad that went 13-1 in C-USA play in 2017. They’re picked fourth and received a first-place vote as well. Also earning one was Florida International, which was a bit surprising since they came in at ninth overall and didn’t have a player on the preseason team. It’s possible someone thought they were voting for Florida Atlantic and had a misprint or that FIU could be the sleeper of the C-USA this season.